Our four main business districts are Riverdale Plaza Shopping Center near the intersection of Riverdale Road and Kenilworth Avenue, the Kenilworth Avenue corridor, the Route 1 (Baltimore Avenue) corridor, and the Riverdale Town Center at the MARC Commuter Rail station (Queensbury Road and Rhode Island Avenue.) We hope that Riverdale's business community offers everything to meet your needs. 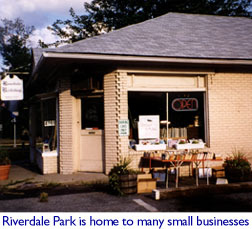 If you are a business owner or prospective business owner, there are several resources available to you, including Small Business Assistance Programs Available to Riverdale Park Businesses and the resources of the Riverdale Business Association. This page was last changed on Friday, July 4, 2003. Questions, comments, or submissions? See the Website Committee web page. This page has been accessed 19456 times.